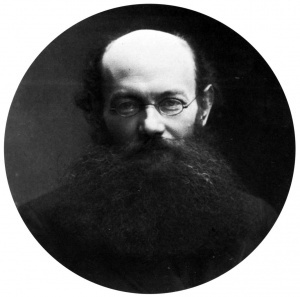 Photo of Kropotkin by Nadar. Photo from Wikipedia. In 1897 Prince Pyotr Alexeyevich Kropotkin (Пётр Алексе́евич Кропо́ткин; 9 December 1842–8 February 1921), the Russian geographer, writer, activist and prominent anarcho-communist toured Canada. He came on the invitation of his friend, James Mavor (1854-1925), Professor of Economics at the University of Toronto, to participate in the 67th annual meeting of the British Association for the Advancement of Science which held its meeting in Toronto. Kropotkin gave two lectures on glacial deposits in Finland which was one of his areas of expertise. Following the conference Kropotkin in a party of several international geologists and geographers, and guided by two Canadian experts, participated in an excursion which the Canadian Pacific Railway organized. The excursion traveled across Canada to Vancouver, British Columbia, and back again to Toronto. It was an excursion full of interest and pleasure for Kropotkin who wrote about it in a 10,000 word essay in the journal The Nineteenth Century. His account gave a very interesting picture not only of the physical nature of late 19th century Canada but also its vigorous pioneering people and society. What interested him most were the lives of the pioneer agriculture settlers and in particular of the Manitoba Mennonites. To them he devoted a tenth of his essay. Kropotkin described Mennonites as prosperous, diligent, cooperative and isolationist. He noted that they left Russia because obligatory military service was enforced upon them. He wrote that they adopted and brought with them the institutions of the Russian communal village and had established in Manitoba comfortable houses, orchards, model farms and businesses. Mennonites refusal to participate with formal justice structures or in state subsidies, or services, including the military was noted as was their toleration by the government. He commented on their many cooperative activities including communal funds for land purchases, cooperative mills, and their own schools. However, he lamented that though they had many communistic tendencies, they were not communists and welcomed private ownership. One area Kropotkin criticized Mennonites was in education. Mennonites only had farmer preachers that were unsalaried and uneducated. That some older leaders restricted education to the Bible created tension in the community, particularly with a teacher like H. H. Ewert of Gretna, Manitoba, who was working to improve levels of education. In spite of their problems and way of life, Kropotkin found their communities and the people to be remarkably successful. An unexpected outcome of Kropotkin’s knowledge of Canada’s toleration of pacifist Mennonite Christians in Manitoba led him to suggest Canada to Leo Tolstoy, who was looking for a safe-haven for persecuted Russian Dukhobors. Kropotkin followed the progress of Dukhobor immigration by first seeking James Mavor’s influence and help in 1898-99 in relocating Dukhobors to Canada and then following their progress for more than a decade. Kropotkin, Peter. “Some of the Resources of Canada” The Nineteenth Century (March 1898): 494-514. Web. 12 July 2013. http://dwardmac.pitzer.edu/Anarchist_Archives/kropotkin/canada.html. Wiebe, Victor G. "Kropotkin, Pyotr Alexeyevich (1842-1921)." Global Anabaptist Mennonite Encyclopedia Online. July 2013. Web. 22 Apr 2019. http://gameo.org/index.php?title=Kropotkin,_Pyotr_Alexeyevich_(1842-1921)&oldid=102401. Wiebe, Victor G. (July 2013). Kropotkin, Pyotr Alexeyevich (1842-1921). Global Anabaptist Mennonite Encyclopedia Online. Retrieved 22 April 2019, from http://gameo.org/index.php?title=Kropotkin,_Pyotr_Alexeyevich_(1842-1921)&oldid=102401. This page was last modified on 12 October 2013, at 07:17.